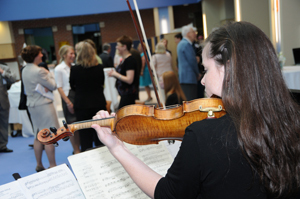 Akron Children’s grand opening of our Emily Cooper Welty Expressive Therapy Center took place last week. We had an event for donors and hospital staff, an event for all staff, and then an event for the community on Saturday. In total, approximately 800 people toured the facility and were bathed in the sunlight that happened to shine on us most of that time. What a mood-lifter! Many attendees worked on an artistic piece for our guestbook or engaged with the various musical instruments on display. The space looked wonderful, but mostly because it was filled with people. Since then, Barb and I have each had some children in the center for sessions and that has been great. It took so many individuals’ time and talents to bring this project to fruition, but it is DONE! Read more blog posts about the expressive therapy center.